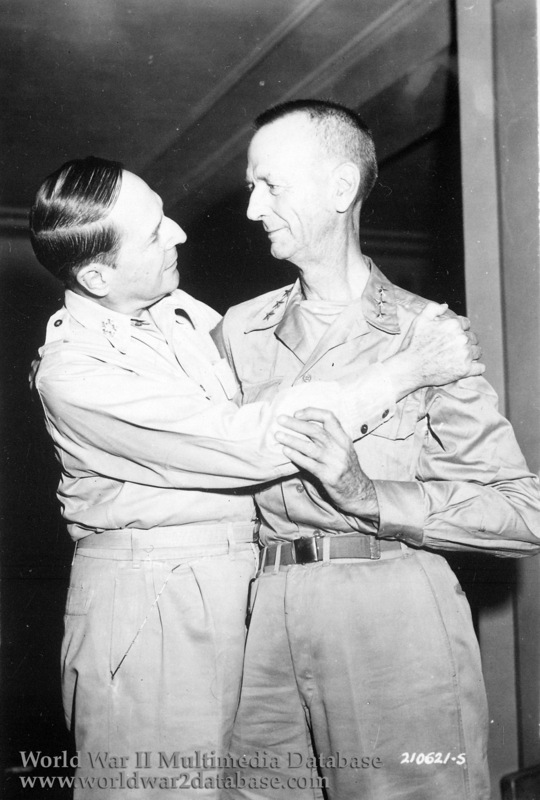 General of the Army Douglas MacArthur and Lieutenant General Jonathan Wainwright greet each other at the New Grand Hotel, Yokohama, Japan, in their first meeting since they parted on Corregidor more that three years before. TIME Magazine, September 10, 1945: "The thin, tired man who had seen the Stars & Stripes pulled down in the Pacific went on to see it raised over the home islands of Japan. At Yokohama's New Grand Hotel he was embraced by his old commander, sat down to dinner served by bowing Japanese. There was a pistol at his hip. To U.S. correspondents on Japanese soil "Skinny" Wainwright said: "It's good to be back a free man and an American soldier wearing a gun again." On May 6, 1942, in the interest of minimising casualties, Wainwright surrendered Corregidor and Luzon. By June 9, Allied forces had completely surrendered. Wainwright was then held in prison camps in northern Luzon, Formosa, and Manchuria until his liberation by a team of O.S.S. operatives led by Major Robert H. Helm in August 1945. He was the highest-ranking American POW, and despite his rank, his treatment at the hands of the Japanese was not pleasant. After witnessing the Japanese surrender aboard the USS Missouri (BB-63) on September 2, together with Lieutenant-General Arthur Percival he returned to the Philippines to receive the surrender of the local Japanese commander, Lieutenant-General Tomoyuki Yamashita. Dubbed by his men a "fighting" general who was willing to get down in the foxholes, Wainwright won the respect of all who were imprisoned with him. He agonized over his decision to surrender Bataan all during his captivity, feeling that he had let his country down. Upon release, the first question he asked was "How am I thought of back in the states?" He was amazed when told he was considered a hero. He was later awarded the Medal of Honor. During Wainwright's imprisonment, General Douglas MacArthur wrote a memorandum that derided Wainwright's leadership abilities, implied that he was both a coward and an alcoholic, and concluded that Wainwright should be denied the Medal of Honor. He forwarded this to Army Chief of Staff George C. Marshall. Ironically, MacArthur was widely scorned for leaving the Philippines and many felt his Medal of Honor was more of a publicity ploy by President Roosevelt because, unlike General Wainwright, MacArthur as army commander did not have the opportunity visit the front lines as often as he wished. Yet, despite the attitudes present at the time and later, Wainwright and MacArthur were two commanders who held off the Japanese onslaught for months, while other countries and allies were falling often with token resistance or by disastrous mistakes. After General Wainwright was released MacArthur embraced and extended every courtesy to Wainwright, even providing him a place of honor at the surrender ceremony. It was because of MacArthur that Wainwright assumed command of an army corps. Even after learning of MacArthur's criticisms, Wainwright still remained friends with the man and even supported him in his Presidential bid in 1952. His Medal of Honor citation reads: "Distinguished himself by intrepid and determined leadership against greatly superior enemy forces. At the repeated risk of life above and beyond the call of duty in his position, he frequented the firing line of his troops where his presence provided the example and incentive that helped make the gallant efforts of these men possible. The final stand on beleaguered Corregidor, for which he was in an important measure personally responsible, commanded the admiration of the Nation's allies. It reflected the high morale of American arms in the face of overwhelming odds. His courage and resolution were a vitally needed inspiration to the then sorely pressed freedom-loving peoples of the world." On September 5, 1945, shortly after the Japanese surrender, he received his 4th star. In January 1946, Wainwright became the commander of the 4th Army, Fort Sam Houston, Texas. He retired in August 1947. He died in 1953 and is buried in Arlington Cemetery.